If you want to do “studio type” shooting, set your flash power manually. On strobes you have to do it that way; on speedlights you can. Then use a flash meter. This shot how-to helps you do that in that situation. Read on. Set your camera to the desired settings. For instance, 100 ISO, 1/125th second, and f/8. These are pretty typical studio settings. Verify that a shot taken like this without the flash is all black. That means ambient light will play no role. If not, go to 1/200th second. Now set up your flash or flashes. Set the power to, say, quarter power for a start – or whatever you think might be roughly right. With experience, you will get this just about right. 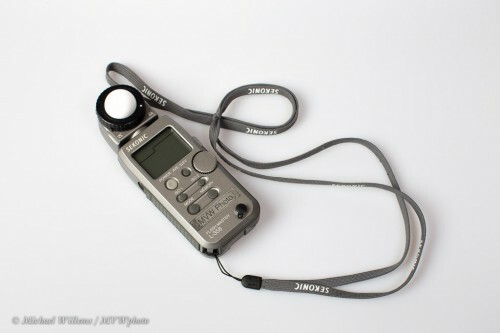 Holding down the the MODE button, set your meter to flash metering mode (the lightning symbol; not the sun symbol, which is ambient metering). Your meter now reacts only to flash. Set the meter to 100 ISO and to 1/125th second (if those are your desired values). Hold the meter, with the white dome extended, where the subject will be. Reset the meter with the side button – it now reads “0” for aperture. Read the value. If the value is higher than f/8 (eg f/11), reduce the flash power or move the flashes away. If the meter reads lower (eg f/4), then increase the power or move the flashes closer. Repeat steps 7-9 until the meter says f/8. That is how you meter a studio, type shot like the one above. I usually meter each light separately and allow for that (e.g. two lights that both say f/5.6 will give you a total of f/8, if light from both hits the subject.). Hello! Great article, thank you! Could you please explain a little bit more how you get a total of f/8 on your example when you meter two lights that both say f/5.6? Thank you. F/5.6 plus f/5.6 equals f/8. Why? Because my subject is hit by TWO LIGHTS that BOTH give me an f/5.6 quantity for light. So I get twice as much light exactly. That means one stop more lights. So my camera has to deal with one stop more light so I have to stop at done more. One step more than 5.6 equals eight. That’s why. Thank you. I’m trying hard to learn how to use flash effectively in a considered and calculated way … not just ‘trial and error’. I am surprised by how many advocates there are of a sort of ‘chimp and change’ approach, which seems very limiting to me. Your explanation is very clear and equally concise. Thank you for putting this so clearly. I have generally been an available light shooter with my manual Leicas (M4-P models) . Then a kind soul bought me a SF20 flash. Results indoors? Overexposure. Now I’m getting a flashmeter. I really need a response on this……I have been doing this for two days…..my meter keeps reading F1, even at full power….is it reading the pre-flash or am I being a dummy by triggering the flash with the shutter button instead of the flash red light test button? wHEN i DO IT AT THE FLASH IT IS READING F45 AT FULL POWER. If you are using ttl, then yes, you are reading the pre-flash. So first, ensure no flash is using ttyl. What exactly are you using?